Palm had a track record of quality smartphones using their webOS and bet the farm in developing the Palm Pre range. While critics loved them, consumers gave them a tepid response and Palm achieved only a 1.5% global market share in 2009; posting a financial loss for 11 straight quarters up to April 2010. In a bold move, HP announced its purchase of Palm for $1.2bn. The prize then was the webOS and HP believed this Linux-based OS would allow them to compete in the mobile device market worldwide. webOS 3 powered the HP Touchpad that launched in August 2011. While it’s possible to think that the tablet market has been buoyant, with the number of product launches since early 2010. Every launch has been a tale of just two tablets; new challenger versus the Apple iPad. The original iPad fuelled and defined the market; with iPad 2 simply improving the performance and versatility of the original. Nearly 40 million iPads have been sold since launch in April 2010, 11 million in Apple’s last financial quarter. While Blackberry’s Playbook and Motorola’s Xoom have gained media attention, 75% of global tablet sales remain with the Apple iPad. The HP Touchpad had a fast processor (1.2GHz dual-core Qualcomm Snapdragon), memory to spare (1GB RAM and either 16 or 32GB HD) and a vibrant 9.7 inch screen. The HP compared favourably against the iPad 2 on many key comparisons, except the bulk of the Touchpad; as it weighed 20% more and was noticeably thicker. But it was the price that was the Achillies’ heal. The HP Touchpad launched with prices from $399/£399, limiting the appeal of HP’s new tablet, as consumers were faced with the thought ‘I could buy an iPad 2 for that.’ Paying similar money, but not purchasing the Apple iPad simply wasn’t going to work. Particularly as so many consumers had already invested heavily in curating their own iTunes media library. The underlying problem, beyond the high price of the HP Touchpad, was not the webOS software; but the lack of App support for it. Whereas the iPad2 has hundreds of thousands of Apps, many optimised just for Apple’s tablet. The Touchpad has a few thousand webOS Apps, only a few hundred of which are designed specifically for HP’s tablet. While these Apps cover all the bases you’d expect; from Social Media (Facebook, WordPress, FreeTexting), to media content (Kindle, TuneIn Radio, HP MovieStore), to business productivity (QuickOffice) and games (Angry Birds, Need For Speed). This is flattery through the shallowest of comparisons and highlights a lack of breadth and depth in the HP webOS App portfolio. In August HP announced that the Touchpad would be scraped and remaining units sold in a fire sale, priced from only $99/£89. It’s not surprising that the remaining stock was snapped up; but by whom? Were these the consumers who were previously waiting to pay several times this price for the HP tablet? Or were they tech bargain hunters, with more modest expectations in terms of future support or App development? Perhaps like the purchasers of the final Betamax VCR’s or MiniDisc Recorder? Buying a tablet at this low price represents great value, but little in the way of certainty for the future. HP have tried to protect their brand by offering to refund the price difference for any customer who paid the original price in the few weeks before the fire sale. They’ve estimated they may lose $100m on clearing the final units at this low price. And they’ve suggested they may continue to try to licence webOS to other manufacturers. But which manufacturers might be interested, and what might they really be interested in? When Nortel, the Canadian telco giant, was put into liquidation in 2009, its portfolio of telco patents was hotly contested in bidding and then group negotiation. Eventually a consortium including Apple, Google, Microsoft, RIM, Ericsson and Sony bought the 6,000 patents for $4.5bn. But controlling the look, feel and function of smartphones through their OS has remained contentious. In the last year Apple and Samsung have tried to counter each others litigation over patent infringements to smartphone OS. And HTC has used several of Google Android patents to litigate against Apple. With Microsoft and Nokia now working closely together, Google, the owner of Android, recently purchased Motorola Mobility for $12.5bn. This leaves HTC, Samsung and LG among the major global handset manufacturers that own little OS intellectual property; as Sony and RIM participated in the Nortel patent purchase and both own larger portfolios of proprietary OS patents. While HTC have previously hedged their bets against Apple OS, by offering both Android and Windows 7 OS smartphones; they are manufacturing smartphones under the respective competitive benevolence of Google and Microsoft. Perhaps the review of whether HTC develop or acquire their own OS may provide appropriate future insurance, despite Peter Chou, their CEO, downplaying this option in August. As HTC’s Chairwoman, Wang Cher, mentioned it maybe worth considering purchasing webOS recently in September. Patents may well shape the future face of competition in the smartphone sector. And HP may get back the money they lost in purchasing Palm and offloading the Touchpad, by selling the patent portfolio they hold. 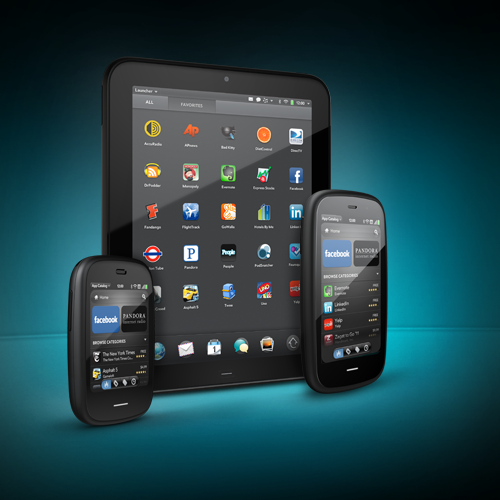 In December 2011, HP announced it would release webOS source code in the near future under an open-source license. Freesource code may sound appealing, but with Google’s Chrome and Android also offering Linux based operating systems, why bother with webOS?